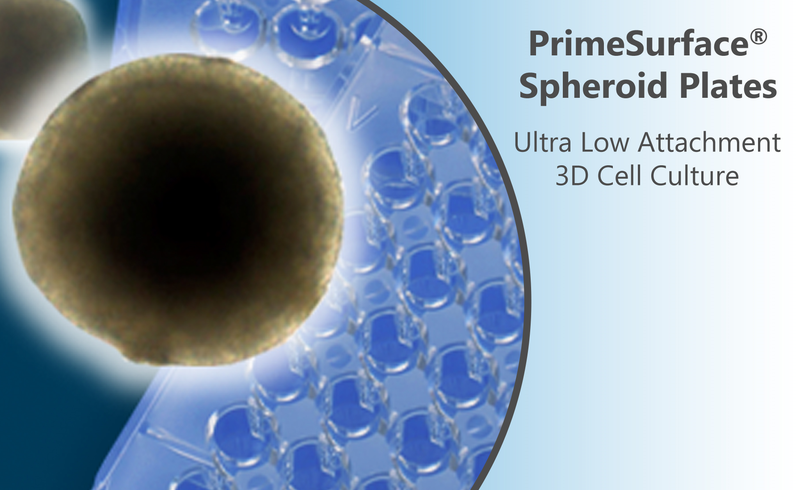 PrimeSurface® cultureware are ultra low attachment (ULA) dishes and plates that promote scaffold free, self assembly of spheroid formation. The plates are pre-coated with unique ultra hydrophilic polymer that enables spontaneous spheroid formation of uniform size and shape. The ULA plates have high optical clarity making them highly suitable for bright field imaging and confocal microscopy. 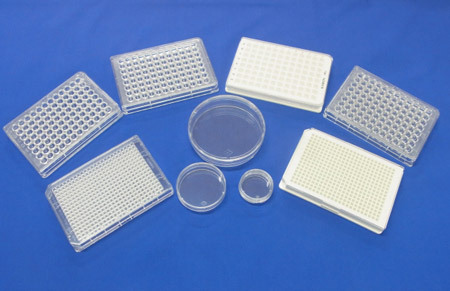 In addition to the widely used 96 well U bottom plate, 96 well plates are also available in V and M bottom, giving scientist a choice to form tighter spheroids that are needed for specific cell types. 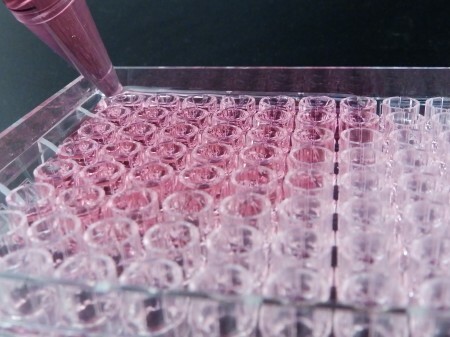 For high throughput screening (HTS) needs, 384 well plates are available in clear and white. Differentiation induction of ES, iPS and mesenchymal stem cells from embryoid body formation. Three dimension spheroid models are more physiologically relevant than two dimension monolayer model. 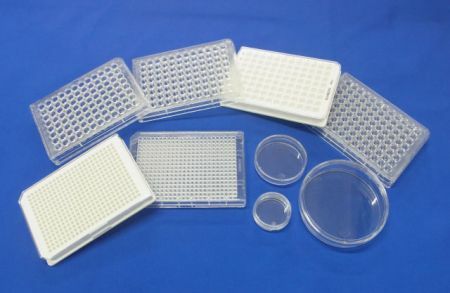 Grow uniform spheroids and Screen for drug response in 96 and 384 well plates. 384 white plates are suitable for Chemiluminescence assays screening. Regenova is a novel robotic system that facilitates the fabrication of three- dimensional cellular structures by placing cellular spheroids in fine needle arrays according to pre-designed 3D data. Followings are examples of such fabrications using S-BIO’s PrimeSurface® 96U plate and Bio 3D Printer, Regenova (Cyfuse Biomedical K.K.). ; neural 3D tissue and 3D tissue with mesenchymal stem cells. For more information, please visit Cyfuse Biomedical K.K.’s website. OHNISHI, Hiroe, et al. Generation of Xeroderma Pigmentosum-A Patient-Derived Induced Pluripotent Stem Cell Line for Use As Future Disease Model. Cellular Reprogramming (Formerly” Cloning and Stem Cells”), 2015, 17. 4: 268-274. Note: Some references refer to the product name as “Cell-Tight ”. Cell Tight was renamed to PrimeSurface®. MISU, Masayasu, et al. Effects of Wnt-10b on proliferation and differentiation of murine melanoma cells. Biochemical and Biophysical Research Communications, 2015, 463. 4: 618-623. NAKANISHI, Yoshito, et al. Mechanism of oncogenic signal activation by the novel fusion kinase FGFR3–BAIAP2L1. Molecular cancer therapeutics, 2015, 14. 3: 704-712. NOZAWA-SUZUKI, Noriko, et al. The inhibitory effect of hypoxic cytotoxin on the expansion of cancer stem cells in ovarian cancer. Biochemical and Biophysical Research Communications, 2015, 457. 4: 706-711. YOSHIDA, Ryohei, et al. EGFR tyrosine kinase inhibitors combined with cytotoxic drugs for treatment of NSCLC with EGFR gene mutations: Efficacy and mechanisms. Cancer research, 2015, 75. 15 Supplement: 3501-3501. KODAMA, Tatsushi, et al. Alectinib shows potent antitumor activity against RET-rearranged non–small cell lung cancer. Molecular cancer therapeutics, 2014, 13. 12: 2910-2918. MIKHAIL, Andrew S, et al. Image-Based Analysis of the Size-and Time-Dependent Penetration of Polymeric Micelles in Multicellular Tumor Spheroids and Tumor Xenografts. International journal of pharmaceutics, 2014, 464. 1–2: 168–177. MORI, Masamichi, et al. The selective anaplastic lymphoma receptor tyrosine kinase inhibitor ASP3026 induces tumor regression and prolongs survival in non-small cell lung cancer model mice. Molecular cancer therapeutics, 2014, 13. 2: 329-340. OHNISHI, Ken, et al. Plastic induction of CD133AC133-positive cells in the microenvironment of glioblastoma spheroids. International journal of oncology, 2014, 45. 2: 581-586. SHIMOZATO, O., et al. Receptor-type protein tyrosine phosphatase κ directly dephosphorylates CD133 and regulates downstream AKT activation. Oncogene (Nature), 2014, 1-12. AKIMOTO, Miho, et al. An inhibitor of HIF-α subunit expression suppresses hypoxia-induced dedifferentiation of human NSCLC into cancer stem cell-like cells. World J Med Genet, 2013, 27. 3(4): 41-45. BRESLIN, Susan and O’DRISCOLL, Lorraine Three-dimensional cell culture: the missing link in drug discovery. Drug Discovery Today, 2013, 18. 5: 240-249. GOUDARZI, Houman, et al. Hypoxia affects in vitro growth of newly established cell lines from patients with malignant pleural mesothelioma. Biomedical Research, 2013, 34. 1: 13-21. ISHII, Genichiro, et al. Morphophenotype of floating colonies derived from a single cancer cell has a critical impact on tumor-forming activity. Pathology International, 2013, 63. 1: 29-36. KATO, Takuma, et al. Protein Transfection Study Using Multicellular Tumor Spheroids of Human Hepatoma Huh-7 Cells. PLoS ONE, 2013, 8. 12: e82876. KESSEL, Sarah, et al. (2013). Progressing 3D Spheroid Analysis into a HTS Drug Discovery Method. Molecular biology of the cell, AMER SOC CELL BIOLOGY 8120 WOODMONT AVE, STE 750, BETHESDA, MD 20814-2755 USA. MIKHAIL, Andrew S, et al. Multicellular Tumor Spheroids for Evaluation of Cytotoxicity and Tumor Growth Inhibitory Effects of Nanomedicines In Vitro: A Comparison of Docetaxel-Loaded Block Copolymer Micelles and Taxotere®. PLoS ONE, 2013, 8. 4: e62630. SATO, Shuji, et al. Identification of the Cancer Cell Proliferation and Survival Functions of proHB-EGF by Using an Anti-HB-EGF Antibody. PLoS ONE, 2013, 8. 1: e54509. KONISHI, Hiroaki, et al. PEGylated liposome IHL-305 markedly improved the survival of ovarian cancer peritoneal metastasis in mouse. BMC Cancer, 2012, 12. 1: 462. MASUDA, Taisuke, et al. A microfabricated platform to form three-dimensional toroidal multicellular aggregate. Biomedical microdevices, 2012, 14. 6: 1085-1093. NISHIMURA, S., et al. MRGD, a MAS-related G-protein coupled receptor, promotes tumorigenisis and is highly expressed in lung cancer. PLoS ONE, 2012, 7. 6: e38618. OYANAGI, Jun, et al. Epithelial-mesenchymal transition stimulates human cancer cells to extend microtubule-based invasive protrusions and suppresses cell growth in collagen gel. PLoS ONE, 2012, 7. 12: e53209. UNO, Makiko, et al. Identification of physiologically active substances as novel ligands for MRGPRD. BioMed Research International, 2012, 2012. 1-9. KOSHIKAWA, Naohiko, et al. Proteolytic activation of heparin-binding EGF-like growth factor by membrane-type matrix metalloproteinase-1 in ovarian carcinoma cells. Cancer science, 2011, 102. 1: 111-116. KUNITA, Akiko, et al. Podoplanin is regulated by AP-1 and promotes platelet aggregation and cell migration in osteosarcoma. The American journal of pathology, 2011, 179. 2: 1041-1049. SAKAMOTO, Hiroshi, et al. CH5424802, a selective ALK inhibitor capable of blocking the resistant gatekeeper mutant. Cancer cell, 2011, 19. 5: 679-690. SAKUMA, Yuji, et al. WZ4002, a third-generation EGFR inhibitor, can overcome anoikis resistance in EGFR-mutant lung adenocarcinomas more efficiently than Src inhibitors. Laboratory Investigation, 2011, 92. 3: 371-383. SHIMIZU, Yutaka, et al. Dienogest, a synthetic progestin, inhibits prostaglandin E2 production and aromatase expression by human endometrial epithelial cells in a spheroid culture system. Steroids, 2011, 76. 1: 60-67. KOGASHIWA, Yasunao, et al. Docetaxel suppresses invasiveness of head and neck cancer cells in vitro. Cancer science, 2010, 101. 6: 1382-1386. MATSUYAMA, Masahiro, et al. Reduced CD73 expression and its association with altered purine nucleotide metabolism in colorectal cancer cells robustly causing liver metastases. Oncology Letters, 2010, 1. 3: 431-436. YAMAGUCHI, Shigeru, et al. Novel Photodynamic Therapy Using Water-dispersed TiO2–Polyethylene Glycol Compound: Evaluation of Antitumor Effect on Glioma Cells and Spheroids In Vitro. Photochemistry and photobiology, 2010, 86. 4: 964-971. HAN, M., et al. Enhanced percolation and gene expression in tumor hypoxia by PEGylated polyplex micelles. Mol Ther, 2009, 17. 8: 1404-1410. WATANABE, Y, et al. A novel translational approach for human malignant pleural mesothelioma: heparanase-assisted dual virotherapy. Oncogene (Nature), 2009, 29. 8: 1145-1154. HAN, M., et al. Transfection study using multicellular tumor spheroids for screening non-viral polymeric gene vectors with low cytotoxicity and high transfection efficiencies. J Control Release, 2007, 121. 1-2: 38-48. KUNITA, Akiko, et al. The platelet aggregation-inducing factor aggrus/podoplanin promotes pulmonary metastasis. The American journal of pathology, 2007, 170. 4: 1337-1347. ICHIOKA, Masayuki, et al. Dienogest, a synthetic progestin, down-regulates expression of CYP19A1 and inflammatory and neuroangiogenesis factors through progesterone receptor isoforms A and B in endometriotic cells. The Journal of steroid biochemistry and molecular biology, 2015, 147. 103-110. MORI, Taisuke, et al. Dienogest reduces HSD17β1 expression and activity in endometriosis. Journal of Endocrinology, 2015, 225. 2: 69-76. PARSONS, Matthew W, et al. Dectin-2 Regulates the Effector Phase of House Dust Mite–Elicited Pulmonary Inflammation Independently from Its Role in Sensitization. The Journal of Immunology, 2014, 192. 4: 1361-1371. BARRETT, Nora A, et al. Cysteinyl leukotriene 2 receptor on dendritic cells negatively regulates ligand-dependent allergic pulmonary inflammation. The Journal of Immunology, 2012, 189. 9: 4556-4565. SOMA, Tsutomu, et al. Hair-inducing ability of human dermal papilla cells cultured under Wnt/β-catenin signalling activation. Experimental dermatology, 2012, 21. 4: 307-309. YAMANAKA, Kaoruko, et al. Dienogest inhibits aromatase and cyclooxygenase-2 expression and prostaglandin E2 production in human endometriotic stromal cells in spheroid culture. Fertil Steril, 2012, 97. 2: 477-482. BRENNAN, Patrick J, et al. Invariant natural killer T cells recognize lipid self antigen induced by microbial danger signals. Nature immunology, 2011, 12. 12: 1202-1211. YOSHIIKE, Yuka and KITAOKA, Takuya Tailoring hybrid glyco-nanolayers composed of chitohexaose and cellohexaose for cell culture applications. Journal of Materials Chemistry, 2011, 21. 30: 11150-11158. MAEKAWA, Akiko, et al. GPR17 regulates immune pulmonary inflammation induced by house dust mites. The Journal of Immunology, 2010, 185. 3: 1846-1854. TAMADA, Atsushi, et al. Autonomous right-screw rotation of growth cone filopodia drives neurite turning. The Journal of Cell Biology, 2010, 188. 3: 429-441. IJIMA, Hiroyuki, et al. Composition of culture medium is more important than co-culture with hepatic non-parenchymal cells in albumin production activity of primary rat hepatocytes, and the effect was enhanced by hepatocytes spheroid culture in collagen gel. BIOCHEMICAL ENGINEERING JOURNAL, 2009, 45. 3: 226-231. ITO, Michiko and TAGUCHI, Tetsushi Enhanced insulin secretion of physically crosslinked pancreatic β-cells by using a poly (ethylene glycol) derivative with oleyl groups. Acta Biomater, 2009, 5. 8: 2945-2952.